Now you can process bank transfers (also known as ACH transactions or eChecks) for a lower fee of 50 cents per transaction. 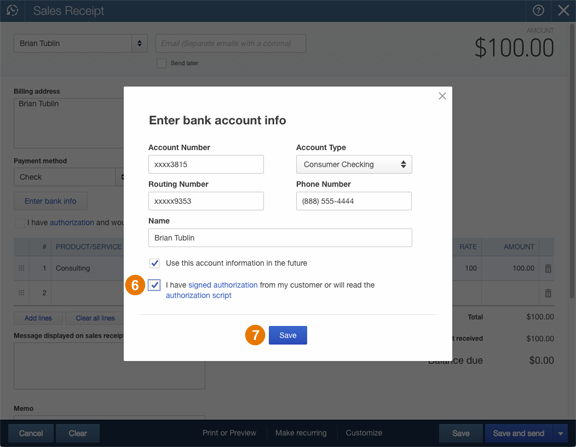 And since you enter each customer’s bank info directly into QuickBooks, QuickBooks takes care of the accounting and saves you time. 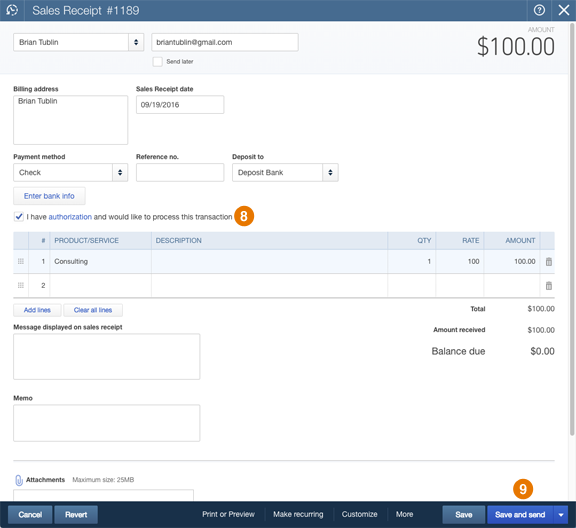 You can stop processing eChecks in the Merchant Service Center and copying the details over to QuickBooks. The rest of this article goes through each step in more detail. Starting from the Receive Payment, Sales Receipt, or Recurring Transactions page, select the Check payment method so that the Enter bank info button appears. Or if you add a new payment method name such as ACH, Bank Transfer, eCheck, Bank, or Transfer and select it, an Enter bank info button appears in those cases, too. 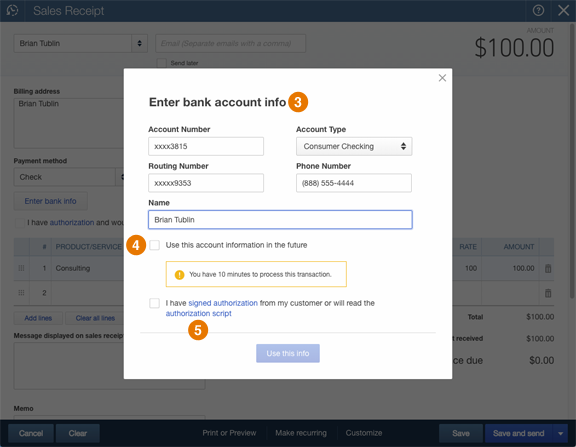 Click Enter bank info and fill out your customer’s bank account info, phone number, and name. If you clear the Use this account information in the future box, you’ll need to process the transaction within 10 minutes for your customer’s security. 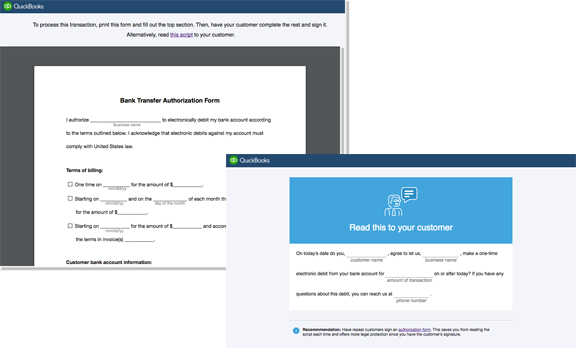 Whether you save the account information for the future or not, you still need to ask for authorization from your customer. Click one of the text links to open the authorization form or script. Close the authorization form or script and select the I have signed authorization checkbox to show you’ve received authorization. Finally, back on the main form, select I have authorization and would like to process this transaction and click Save and send. 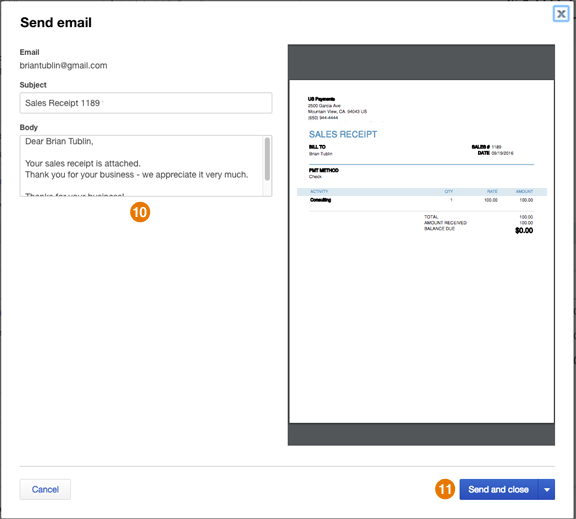 Make any changes to the email message to send to your customer and click Save and close. You’ll get a receipt confirming that the payment is on its way! 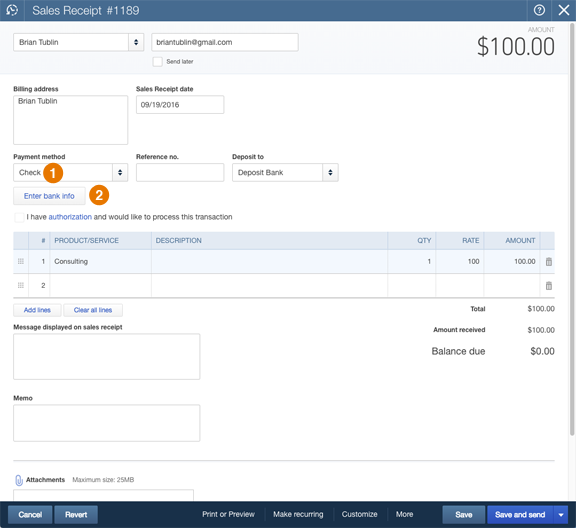 Plus, QuickBooks automatically records the payment to keep your books up to date.